Get crisp 4K video that's as epic as the moment itself. 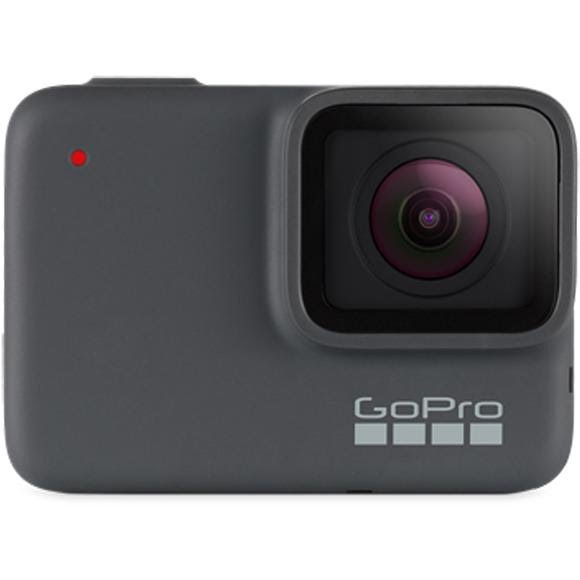 The GoPro Hero 7 Silver Camera is built to handle whatever you throw at it and waterproof to 33ft (10m). Capture natural-looking photos with detail even in dark areas thanks to Wide Dynamic Range (WDR). Track your speed, distance, and elevation, then prove it by adding stickers to videos in the GoPro app. Get crisp 4K video that&apos;s as epic as the moment itself. The GoPro Hero 7 Silver Camera is built to handle whatever you throw at it and waterproof to 33ft (10m). Capture natural-looking photos with detail even in dark areas thanks to Wide Dynamic Range (WDR). Track your speed, distance, and elevation, then prove it by adding stickers to videos in the GoPro app. Turn long eventsâ€“like sunsets and birthday parties into short, sharable moments with Time Lapse Video. Swipe through shots and tap through modes - it&apos;s fast and easy.